- Solid aluminum body with beautiful matte finish. - Smooth drag, efficient casting, and fast retrieve. - Available in both right hand and left hand model. - Its removable side plate can be a bit of problem as it easily open accidentally and fall into water. - All parts involved in the lock mechanism are made of plastic. Are you looking for a reel in the price range of $100-$120 that is solidly built, cast a long distance, and provides smooth retrieve? If yes, you must give the Inception a serious look. It has many great features to improve your fishing experience. The cast is smooth and long, retrieve fast and easy, and drag extremely impressive—and all that at a great price. The 13 Fishing Inception comes packed with a slew of useful features, which will make your fishing all the more pleasurable. Solidly constructed, the reel has an aluminum body with a smart dark grey matte finish and you get a great feel when you hold it in your hands. The durable EVA knobs give you a tight grip, even with wet hands. 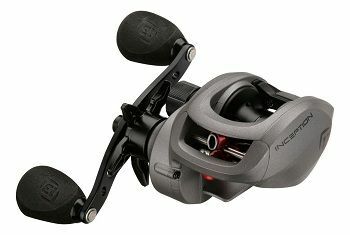 Additionally, the reel features an efficient drag system with maximum drag of 18 lbs. There are two variants available in the Inception series, one with 8.1:1 gear ratio and the other with 6.6:1 gear ratio. Both are available in right and left hand models. The Inception has an impressive casting ability. You can cast long and accurately with it with ease and the reel performs smoothly on retrieve, much thanks to its 8 ball bearing system. Furthermore, the reel is compatible with almost everything, from jerkbaits and crankbaits to flipping and casting jigs. You will also be able to throw umbrella rigs, as well as big swimbaits if you like. You can also pair the reel with different rods. The Inception reel features an HD aluminum frame and the side plates are made of graphite. Aluminum reels are quite sturdy and last a long time, and there’s nothing in the construction or design of the Inception that suggests this will not be the case with this reel also. A solidly constructed reel, the Inception has no flimsy or loose parts. All moving parts are smooth in performance and you won’t have to worry about back play. Unlike the cork grips in previous models from 13 Fishing, the Inception features gripable and durable EVA knobs. Thanks to its comfortable handles, you can easily fish all day long. The Inception feels awesome on the rod and extremely solid in your palm. 13 Fishing has opted for a matte finish, which looks extremely durable and lends the reel a great feel when you use it. You should always ensure that the reel you are eying provides a reel gear ratio that’s suitable for your fishing needs. If you are looking for a high-speed retrieve, you wouldn’t be disappointed with the Inception. A reel gear ratio of 6:1 or above is taken as a high-speed retrieve. With a reel gear ratio of 8.1:1, the Inception provides you high speed retrieve. Another extremely important thing to consider in a reel is its drag system. You get a consistent and smooth drag with the Inception reel, thanks to its efficient drag system which features multi-material oversized drag washers. You don’t have to worry about broken lines and lost fish. You will be able to pull out the line steadily and smoothly, without any hesitation, at whatever amount of tension you set the drag. The maximum drag you get is 18 lbs, which is quite impressive. 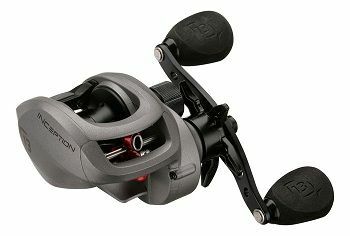 The Inception reels features a dynamic 8-ball bearing system. This means that you can easily cast a long distance and will enjoy smooth retrieve. Generally speaking, reels with more number of ball bearings provide smoother retrieve. Anything above 6 ball bearings is fine, and 8 ball bearings almost guarantee smooth retrieve. In addition to including enough ball bearings, 13 Fishing also takes care of the quality of ball bearings. They have opted for upgraded high spin corrosion resistant ball bearings. In other words, these stainless steel ball bearings will last a long, long time. Unlike other reels in its price range, the Inception has all important things covered. The body is lightweight, yet solid, so you can hold it all day long, the drag system is effective, the retrieve is fast and smooth, and the casting is long and accurate. 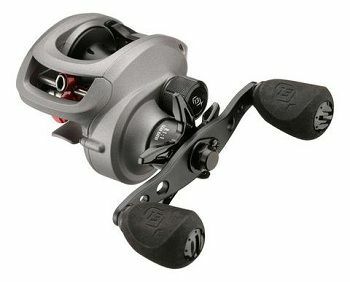 A fantastic reel, the Inception offers great, probably best, value for money.